When it comes to people working together to build great software, the right tools can make all the difference. That’s why we’ve teamed up with the fine folks behind JIRA — the software development app favored by thousands of agile product teams — to bring you the new JIRA Cloud app for Slack. Connecting our products simplifies the development process by enabling engineers, product managers, and QA teams to work together easily and ship great stuff. With the new JIRA app, you can work through issues in Slack by subscribing to notifications on key matters and pulling in deeper contextual information when needed. Say your team is working through a product sprint, and you want to know the status of a specific issue. Upon typing out a bug classification (“TIS-14” in the demo below), the new JIRA bot will post a message right in your conversation containing a basic summary of the issue. This saves your team the worky-work of copying and pasting links to a separate application, and instead gives your team more context on the issue in the place where you’re already talking about it. If you are working in Slack and need to look up a specific issue in JIRA, instead of having to jump out of your workflow, you can now ask the JIRA bot to find that information and send it directly to you. 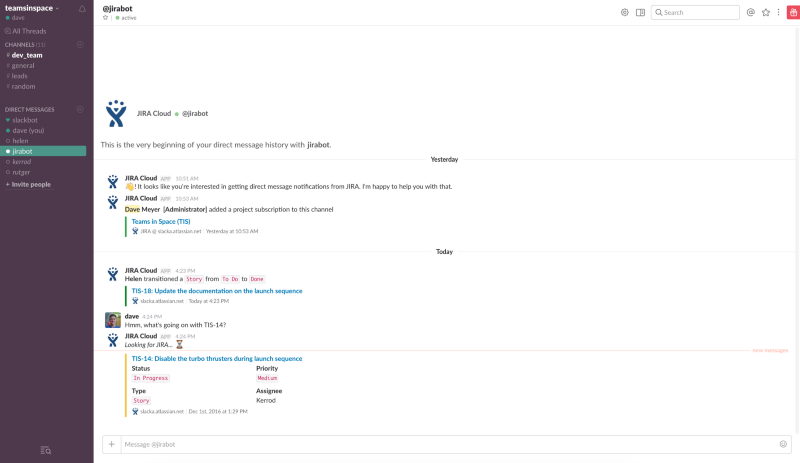 The existing JIRA integration, called JIRA server alerts, is one of the most popular apps for development teams using Slack. You can find JIRA server alerts and the new JIRA Cloud app in Slack’s App Directory. Got a question or need help? Feel free to send feedback or tweet us at @SlackHQ.